Tiny contributions from many people can amount to something cool in the aggregate. That's the idea behind many Internet success stories - Flickr, Wikipedia, etc. - and also seems to be the philosophy driving a new UK science project to monitor air pollution. 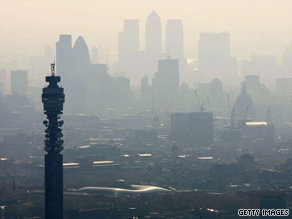 Scientists have given out small pollution sensors to 100 commuters, cyclists and pedestrians, the BBC reports. Those sensors will help scientists get a real-time picture of air quality. Each sensor has a satellite positioning system, so we could have a bus create a map of the air pollution as it drives along its route. This data could be used to provide people with local information – perhaps advice for those with respiratory problems about their journey to work. In a wider sense, it could also be used by traffic managers, helping them decide how to phase traffic lights in a way that might reduce traffic pollution. It's a new twist on the idea of "citizen science," which I wrote about for CNN.com. As funding for scientific research gets tight, scientists are turning to everyday people for help in collecting basic data. The Internet has given the idea momentum, as it makes it easy for people with common hobbies and research interests to link up. Also see this previous SciTech blog post with a list of citizen science projects - some of them submitted by readers. I've been comtemplating for years on the pollution, and I have many of ideas, but to make it simple. The pollution comes from burnin coals to make fire boiling the water to make steam to turn a turbine to create electricity. Simple sollution, change the fire. Using something to compare it to, change the plants from a gas burnner to a electric burner. Change what boils the water. Do we get a tax break or cash for being a social thermometer? OK, so how many greenies are going to hook it up to their car's tailpipe to inflate the numbers and make the situation 100x more dire than it really is? Science is done in controlled conditions, monitored by professionals, and reviewable by other scientists. This proposal is none of those, so it is not science – more of a social experiment.